Our blog is focused on inclusive education, which means we mostly publish how-to tips that teachers can use in their classrooms. But creating an equitable and just society also means thinking outside the school walls—and supporting students’ access to things like transportation, community life, and health care. Today’s guest Q&A focuses on a critical health care issue: dental care for students with developmental disabilities. Dr. Greg Grillo of dentably.com, a practicing dentist with experience treating children and adults with disabilities, is here to answer five common questions about making dental visits as smooth and comfortable as possible. Share this Q&A with the parents of your students (and get more information on the Dentably website). Q. 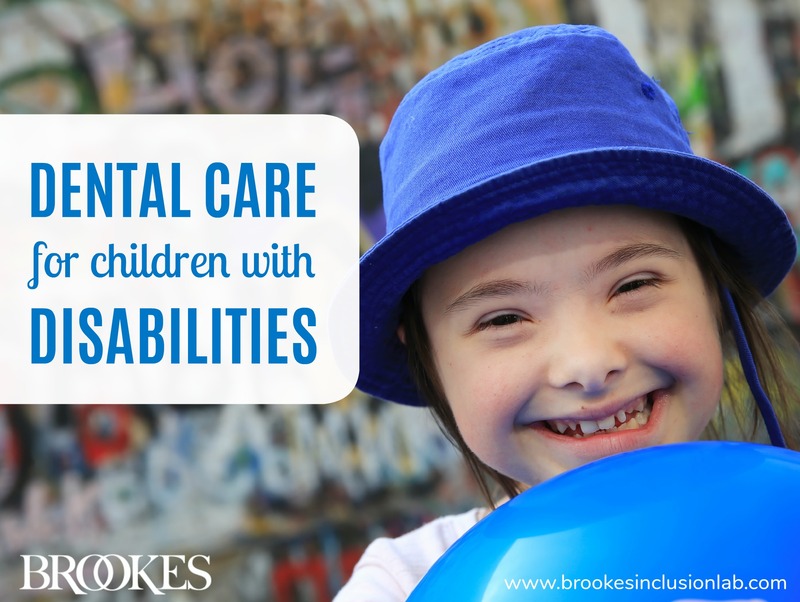 What challenges might a child or young adult with a developmental disability encounter at the dentist’s office? What features of a dental visit are usually the toughest? A. There are many sensory elements that come along with visiting the dentist. Hearing the loud noises and experiencing the strange tools in your mouth for the first time can cause anxious or nervous feelings for anyone. In children or young adults with autism or Down syndrome, for example, they can be more sensitive to the sensory elements at the dentist, making it a lot harder for them to be comfortable. Overcoming these sensory issues is one of the most difficult challenges a child with a disability may encounter at the dentist’s office. As a dentist who’s been practicing for more than 17 years, I know how real these anxieties can be. Despite these challenges, there are many important steps one can take to make the child more comfortable. One way to make going to the dentist easier is by scheduling a desensitization appointment. These are appointments that allow a child or young adult to visit the dentist without having any work done. They can meet the office and staff, see the tools, and practice sitting in the dental chairs. Q. Finding a dentist who’s the “right fit” might feel daunting to parents. How would you suggest they get started with their search? A. Finding the right dentist may feel like an overwhelming task. Luckily, there are many ways to begin searching for the perfect dentist for your child. There are referral websites that you can use such as the American Dental Association that allow you to search for a dentist by location and specialty. You can also talk to your primary health care provider to see if they have any recommendations for a dentist in your area. When speaking with potential dentists, be sure to ask a lot of questions. This is the best way to know if the dentist will be a good fit for your child. Some questions that you can start with are asking if they are comfortable working with patients who have disabilities and if they have experience working with them. Listen for specific examples to ensure that they can meet the needs of your child. My biggest advice to you when searching for a dentist is to be diligent in your search. It is a learning process, but there is a perfect dentist out there for your child. Dental care is extremely important for one’s overall health and well-being, so don’t give up. Q. What should parents do before the appointment to prepare their child for visiting the dentist? A. There are many ways you can help your child prepare for their dental visit. As a parent, you are one of their biggest support systems and your child will rely on you to help them through their dental experiences. Since many children with disabilities can have sensory issues, preparing them for an appointment can help overcome any issues they may have. Using visuals is a great way to help prepare for a child’s appointment. Storybooks and videos can help your child picture what a dentist appointment will be like when they go. As mentioned before, meeting the staff and seeing the office prior to a child’s dental appointment can help familiarize them with the office and make it less intimidating. Q. What are some of the types of accommodations parents and self-advocates can ask for at the dentist to make the visit more comfortable? A. Every child is different and unique in their needs and most dentists are willing to make any accommodations needed for your child. Some of the most common accommodations that parents ask for are using specific flavors of toothpaste, reducing waiting room times, and having the dental chair remain in the same position the whole time. If there is anything you feel your child may need during their appointment, just ask the office and staff members before the appointment and work out any accommodations that need to be made for your child. Dentists are committed to making dental appointments as comfortable as possible and will do what they can to ensure this. Q. What are a few other recommended resources that parents and teachers should have in their toolbox? A. Many resources are available for parents, teachers, and advocates to have for all things dental care. As mentioned before, the American Dental Association is a great place for resources. They have articles, information, and places for you to find dental care. The National Down Syndrome Society is also a great resource for health care and is full of dental information and resources for support and care. This Autism Dental Information Guide from SARRC can help, too. Good dental hygiene is essential to one’s overall health and well-being. It’s important that children begin receiving dental care from an early age to ensure that they have a healthy mouth for life. In kids and young adults with disabilities, there may be some added nerves surrounding the dentist, but these tips can help make it a little easier. Going to the dentist is a great learning experience for you and your child, so do your best to embrace it and enjoy learning new things. Thanks to Dr. Grillo for being here today and answering our questions! To learn more, check out Dental Care Guidance for Caregivers of Patients with Down Syndrome, a free resource offered by Dentably, a group of experts who offer reliable information on dental health with a special focus on dental care for people with disabilities. Dr. Greg Grillo’s more than two decades of expertise, combined with his passion for dental marketing and knowledge of dental software, make him an invaluable asset to the Emergency Dentists USA/Dentably team. And because he’s still working as a dental practitioner and constantly taking new courses to stay educated, he knows better than anyone what our readers can expect when they visit a special needs dentist.